It is much safer and easier to check out via PayPal. We will ship to confirmed PAYPAL address. Please make sure your payment address in your PayPal account is correct. 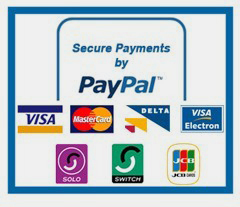 All major credit cards are accepted through our secure payment processor PayPal. Please don’t forget to fill in the complete shipping information on our website. The shipment will be sent to the address you registered. When you check out via Google Checkout,you also have to sign in with the correct shipping information.We also recommend you to register as our Gorgeouslim Member as we can send you the updated shipping status by email.